This blanket ensures you keep the sand at the beach, not in your car or at home. 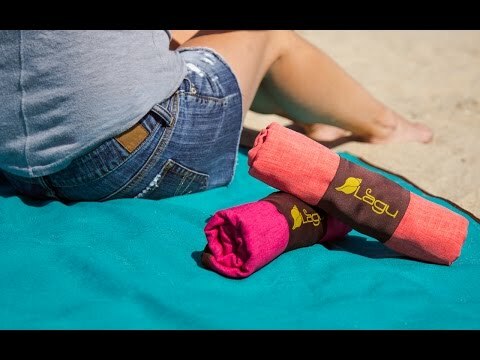 Made of a polyester blend that repels sand (really—it doesn’t stick), Lagu lets you relax in grit-free comfort and easily folds up for storage. Plus, it contributes to beach conservation by keeping sand on the coast where it belongs. Dimensions: Regular: 43" x 57"; Large: 60" x 75"
For those of us who love sunny days at the beach—but not bringing the sand home—there’s Lagu. This beach blanket’s allergen-free fabric actually repels sand. So you can relax on the beach in comfort, and go home without bringing half the beach with you. 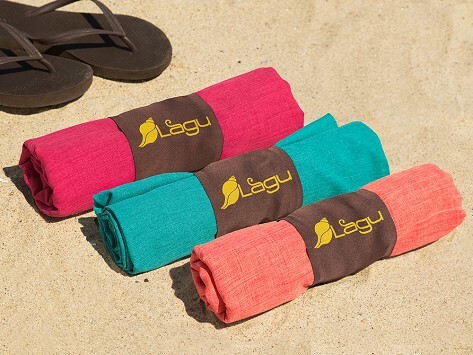 But there’s more to Lagu than just keeping you sand-free—this is a beach blanket with a mission. Sand depletion at beaches is a serious concern. In fact, a university study suggests that every beachgoer unintentionally takes at least three handfuls of sand away each visit. Add it up, and that’s a lot of beach that goes bye-bye. Kendrick Co created Lagu after returning to a popular resort in the Philippines. He noticed the beach was narrower than he remembered. Lagu was his way of helping to reverse this trend: less sand on your blanket, more on the beach.